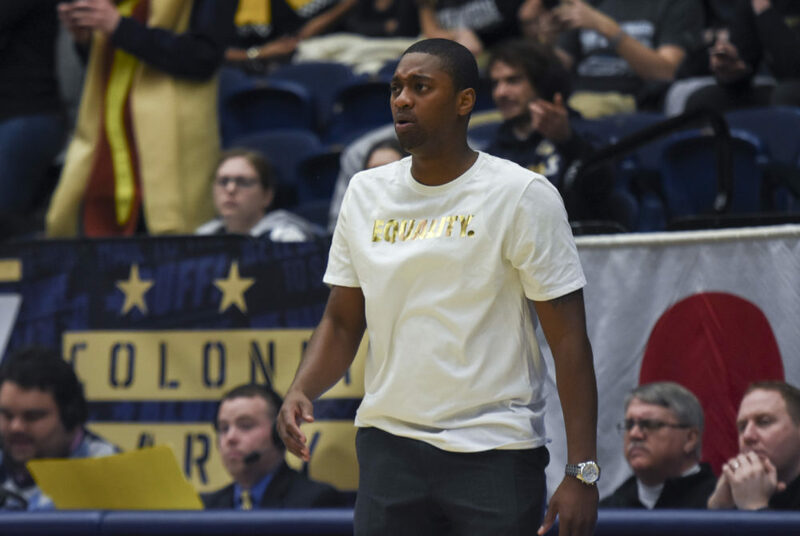 Head coach Maurice Joseph and the rest of men's basketball wore shirts with the word 'EQUALITY.' across the front during their game against Davidson Saturday. A photo of two sorority members on campus with a racist caption spread across social media Thursday morning, triggering a wave of backlash and debate from students and alumni. Following Saturday’s men’s basketball game against Davidson, head coach Maurice Joseph joined the conversation. Instead of taking the court in their usual suit and tie, Joseph and his coaching staff all wore white Nike shirts with the word ‘EQUALITY.’ across the front. Players – who wore the same shirts in black instead of their regular GW warm-ups – said they supported the sentiments of Joseph’s comments. The women in the photo, who have not been publicly identified, were expelled from their sorority, but no other official action has been announced by GW. Joseph – who has been at GW for seven seasons – said the racial divisiveness of the Snapchat post is not normal within GW’s community and that he supports the University’s effort as they continue to investigate. Athletic teams and players around the country, at the collegiate and professional level, have made similar statements supporting racial equality. In recent years, athletes have begun national conversations by kneeling during the national anthem or wearing ‘I can’t breathe’ shirts during basketball games – to stand up against police brutality. The men’s basketball team – one of GW’s most public programs – hasn’t taken any controversial or public stances on hot-button issues in at least the last two years that Joseph has been coach. But Joseph said he wants his team to stand at the forefront of the University’s movement towards equality. Players on the men’s basketball team represent multiple cities, states and countries, as well as multiple races and ethnicities. Joseph is one of less than 15 percent of non-white men’s college head coaches, according to the most recent Racial and Gender Report Card from the University of Central Florida.